Rack of Honeywell’s Lamb with Cumberland sauce, this is a dinner party classic that would be perfect for a festive soirée or a New Year’s Eve show stopping dinner! It’s super simple to make, the Cumberland sauce works perfectly with the richness of the lamb and is wonderfully festive with its rich crimson colour! 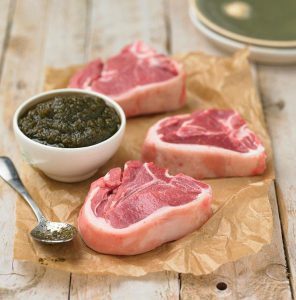 Ask the Butcher to French Trim racks of lamb enough for 4 chops per serving. 1. Marinade the rack’s of lamb in fresh rosemary garlic and olive oil over night in the fridge. 2. Cover the chop bones only with foil and cook in a place in an open roasting tin. 3. Cook in a pre heated oven 190c to your preference, for example 25 minutes will cook to just pink in the middle of the loin. For the sauce you will need. 1 jar of good red current jelly. Half a lime and half a lemon, zest them both and cut into very fine strips then squeeze the halves. 1. Melt the jelly into a sauce pan when melted add the zest and juice of the lemon and lime to the jelly. 2. Allow the mixture to simmer gently and stir in the Port, mustard and nutmeg. 3. Reduce by a third and keep warm till ready to serve. Serve with dauphine’s or fondant potatoes green beans and a Cumberland sauce (best home made). Cut the racks of cooked lamb into chops using a sharp knife and pop into a warm oven, place the potatoes in the centre of the plate, arrange four cutlets around the potatoes so the bone ends meet in the middle above the potatoes, add the green beans and allow your guests to serve themselves with warm Cumberland sauce from a sauce boat.